Most of the challenges facing fare collection revolve around the ease of use for your riders. Using multiple systems or complicated fare structures makes it difficult for new riders to feel comfortable, because they fear not having the correct ticket or amount of cash on hand. If your riders make a mistake because of an overly complicated faring structure, they pay the price for that mistake. Another challenge is making the process of purchasing tickets/fares as streamlined as other current technologies – people simply want the same access to technology they use everyday, when riding on transit. Is the answer mobile ticketing? Ticket vending machines? Pre-loaded smartcards? These are fantastic areas to start. Earlier this year, Southeastern Pennsylvania Transportation Authority (SEPTA) announced they would stop using nostalgic fare tokens. This is a symbolic change to signify a shift in industry mindset for North American transit agencies, as it is one of the last major agencies in the U.S. to stop using tokens – it’s finally time to move into the technological present and prepare for the future. The best way to accomplish this is to look at our surrounding industries. There is a massive shift in how people are purchasing goods and services. 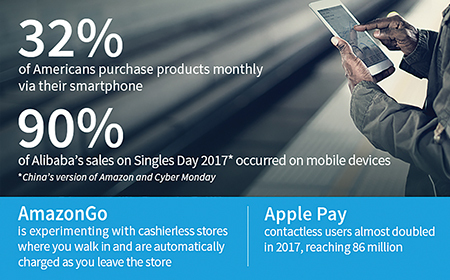 Less physical cash is being used, and more transactions are occurring digitally – specifically with mobile devices. With the advent of mobile wallets, app purchases, and mobile e-commerce on the rise, mobile purchasing is becoming more popular and accepted. Combining these trends with technologies that allow consumers to search for, find, and purchase an item through a photo shows society’s growing dependency on their mobile devices – and the transactions they are willing to make with them. An emerging payment concept is Check In / Check Out (CICO). This requires the rider to activate the rider’s preferred payment method (smartcard, mobile phone, credit card) to begin the process. With CICO, the user must close the transaction with a second interaction to note that the trip is complete. This is common for agencies that determine faring based on zoning or distance traveled. The newest method to generate interest is a completely hands-free methodology of automatic fare collection. Be-In / Be-Out (BIBO) takes away all the fuss related to riders figuring out different payment options and allows them to, simply, get on and off the vehicle without doing a thing. The technology (with the use of a smart card or a smartphone) can detect when an individual rider is on the vehicle, tracks them, and knows when they’ve left the vehicle and completed their trip. The other major bonus from this is the many-to-one aspect of the technology. With conventional methods or even CICO, an interaction must occur to start the journey – a one-to-one transaction, taking up valuable time – for your customers to ride your system. With BIBO, it’s estimated you can process up to 300 users in 15 seconds. Because of quicker boarder times and accurate collection of multiple fares at once, BIBO also benefits on-time performance and cost recovery of fares, which creates more capital to operate and reinvest in your agency. Unless your agency is already at the forefront of faring technologies and practices, you might need to do some things before you make hands-free fare payment a reality. It would be a big leap to go from tapping a smart card on a validator, to having someone walk onto a bus and sit down without any interactions. So, if you aren’t there yet, a step approach would be best. First, consider your riders’ fare purchasing trends. If your riders’ trends or concerns don’t align with the need to provide cashless and fast purchasing options, there may be other considerations (rerouting your system or better real-time information) to address before switching to a BIBO system. Next, if you haven’t already set it up, you should begin with moving to an account-based back office and mobile ticketing. Once this is done, perform a survey of your vehicles to determine best locations for rider detection hardware. It is needed to detect their smart cards or mobile applications – which will indicate the rider’s presence on the vehicle – for BIBO systems to work. While this technology isn’t far from being a reality – trial and pilot projects are happening in Europe with success – it’s vital you understand your ridership and their demands and needs. These trends will make their way to transit fares. How are you going to capitalize on this new generation? Mark Poole has over 30 years of experience implementing vehicle and mobile computing solutions. Poole recently joined Trapeze Group as the industry solutions manager for automatic fare collection (AFC) to help customers evolve their systems to the latest faring technologies. Visit www.trapezegroup.com for more information.